There’s plenty going on in Liverpool and at the University in March. We’ve rounded up six events you can get head along to below. If you want to share any of your photos from the events with us, tag us on Twitter @LivUni or share them on Instagram using the hashtag #LivUni. 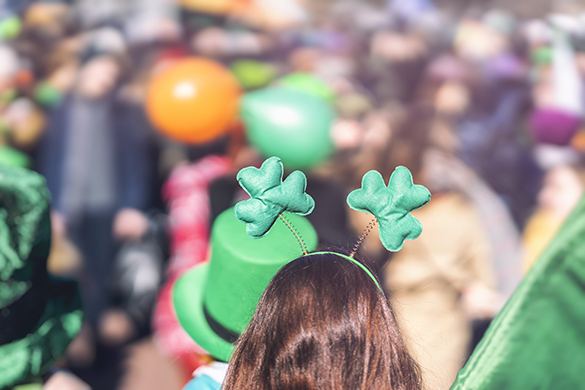 The fourth annual St Patrick’s Day Parade will be starting at Great Orford Street at 12pm this Sunday. If you head down to the parade, you’ll see the Liverpool Katumba Drummers perform. There’s also an Irish flute band, a pipe band, dancers and some first-rate fancy dress. Get out of the city and head over to the Wirral to explore some incredible green spaces with the Guild. Nature Experts will take you on the guided walk, which sets off from the Guild Reception at 13:15. To book your place on the walk, visit the Wildlife Walk webpage. Taking place in Waterloo, you can enjoy a night of vegan food with Vegan House. The menu includes south fried seitan chicken and chips with rainbow slaw. To book your ticket, visit Skiddle. This year’s BBC6 Music Festival is taking place in Liverpool and lots of the bands will be performing on campus in Mountford Hall. The line-up is varied and includes bands like Hot Chip, performers like Jon Hopkins and DJ sets. Poet Roger McGough is also set to appear at the festival in conversation with Cerys Matthews and there will be a record fair, screen-painting and 6 Music Bingo with Jonny Bongo from Bongo’s Bingo. The Walker Art Gallery is hosting 12 of Leonardo da Vinci’s drawings to mark the 500th anniversary of the polymath’s death. The exhibition is free and the drawings are displayed so that you can get up close to see all of their minute details. There are 12 exhibitions taking place across the UK this spring, so if you’re leaving Liverpool at any point between now and May you might be able to catch one or two of the other exhibitions too.